The 2014 operating award for "Route 66 On The Air"
It's been called the "Great Diagonal Way", the "Will Rogers Memorial Highway", the "Mother Road", the "Main Street of America, and the "Electric Highway". Of the 4 million miles of highways in the United States, none are more famous than the 2,451 miles that once made up U.S. 66, better known as "Route 66". 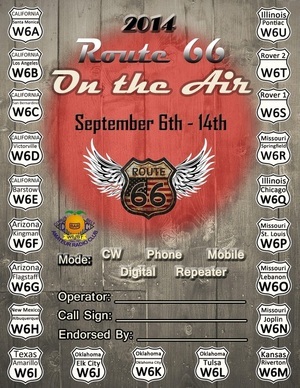 Starting on September 6th you will have nine days to travel Route 66 once again, this time via the airwaves. Twenty one Special Event stations, each located in a city along the route, will join together for the 15th annual "Route 66 On The Air". The event, which was created by the Northern Arizona DX Club and is now organized by the Citrus Belt Amateur Radio Club of San Bernardino, Cali-fornia, allows the participants to traverse the route one more time, by radio. Beginning in 1926, millions of people travelled the road which began at Jackson Street and Michigan Avenue in Chicago and ended at 7th Street and Broadway in Los Angeles. In 1936 the road was extended to the intersection of Olympic Blvd and Lincoln Blvd. in Santa Monica, California. Santa Monica has also promoted the inter-section of Ocean Blvd. and Santa Monica Blvd and also the Santa Monica Pier as the ending point, but Route 66 never ended at either of those places. The Dust Bowl of the 1930's saw 200,000 "Okies", "Arkies", and "Texies" loose their farms to the elements and to the banks. These plains dwellers, packed up their families and traveled Route 66 in search of agriculture jobs in California. Their westward migration began to create a need for travel services all along the road to the Pacific. Although in many places, U.S. 66 was little more than a single, 9 foot wide lane of asphalt, by the war years of the 1940's the route had spawned thousands of service stations, motor lodges, souvenir shops, and eateries. In 1940 the very first McDonalds opened along Route 66 at the corner of North E Street and West 14th Street in San Bernardino, California. But the distinction as the very first drive-thru restaurant goes to another Route 66 icon, "Red's Giant Hamburg" which was in Springfield, Missouri. "Get your Kicks on Route 66" was recorded by Nat King Cole in 1946. The song was written earlier that year by Bobby Troup who was inspired after a ten day trip on the road. Chuck Berry, the Rolling Stones, and a host of others have re-recorded the song over the years. By the 1950's Route 66 had become a neon highway. Even the most remote sections of the road held some recently added "landmark" designed to separate the many families travelling on vacation from their money. A family could spend the night in a genuine Indian wig-wam (although really shaped like a ti-pi and made of concrete) in two locations along Route 66, Holbrook, AZ and San Bernadino, CA. Meteorite craters. leaning water towers, the worlds largest Ketchup bottle, Cadillac's planted nose first into the ground, a round barn, a giant orange, and the world's largest map were just a few of the thousands of attractions that dotted the landscape along Route 66. Every few miles one could see a freshly painted barn, courtesy of workers from the Meramac Caverns of Stanton, Missouri. 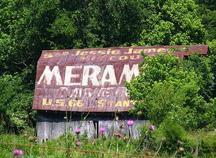 Meramac would paint a farmers barn for free in exchange for being allowed to emblazon the roof and sides of the barn with ads enticing travelers to visit "Jesse James Hideout". In 1960 Hollywood took note of Route 66 with the creation of the television series of the same name. For four years two young men in a Corvette convertible sought adventure on the open road. While the '50s and '60s gave Route 66 it's most prosperous times, it was 1956 that began it's slow death. With the introduction, that year, of the Interstate Highway System, the narrow, little Route 66 began to be replaced by new super-highways. On June 27, 1985 the government decertified the highway and U.S. 66 ceased to exist. Today, many of the states operate sections of the original road as state routes. The largest portion in use is in Arizona, where you can still 'stand on the corner in Winslow, Arizona', pet dozens of wild burros as they beg handouts from the tourists on Route 66 in Oatman, view the petrified forest in the Painted Desert, and take a peak at that giant meteor crater.